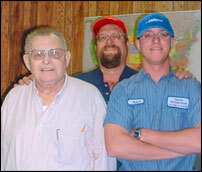 Wayne Mooneyham Heating & Cooling located in Burlington, North Carolina - We sell the best & service the rest. The quality of your installation is the most important ingredient of your new heating and cooling system. We at WAYNE MOONEYHAM HEATING & COOLING take pride in our commitment to consistently provide premium heating and cooling systems for our customers. Our experience of over 68 years (since 1949) gives you the confidence and security you need to have for your investment. We personally supervise all areas of work. We are licensed (NC State Heating License #20229 & NC State Electrical License #10813-L) and insured. You cannot get better or more honest service on your heating and cooling system. If it should be repaired, we will repair it. If you are throwing good dollars after bad, we will tell you so. We will give you an evaluation of your system on a 1-10 scale. is the smart solution to your heating and cooling needs! Copyright 2017 Wayne Mooneyham Heating & Cooling Site by Sites Computer Resources, Inc.